There have been some big changes On Sutton Place. I’m not even sure when I last showed you my kitchen but I’m fairly certain it’s been at least a year. A few months ago something I have been waiting on, seems like forEVER, actually happened. I got new appliances! I cannot even begin to tell you how thrilled I am. My old appliances were troopers and may have hung in there a few more years. Thankfully we didn’t wait until they were completely done-for and I was able to look around to find what I wanted…but also what would fit in my spaces. My kitchen is small by today’s standards, especially the slot for the refrigerator. I had exactly three styles to choose from that were available in stainless steel and that would fit. I went with Maytag for everything and could not be happier. So after the appliances were delivered and I stopped doing my happy dance, I decided the rest of the kitchen needed a refresh. I made a new window treatment from a piece of vintage mangle cloth I’d been saving for a while. I actually had 2 matching cloths which is almost impossible to find. I used the previous valance as a guide and hung this new one on the same hooks. I didn’t cut this mangle cloth. I simply folded it in half lengthwise and spaced the tabs for the hooks so it would drape just a bit. I used part of the second cloth to make little slipcovers for my island stools. The vintage fabric Gods were watching over me because the width of this cloth was the exact measurement I needed for the backs of the stools. These are made just like a pillowcase. I folded the cloth lengthwise, just like I did for the valance, and cut 2 pieces the width of the stool backs (one piece for each stool.) A straight stitch down the sides and they were finished. I had little cushions on the stools for a few years and I like the change with the rush seats showing. I made one more update and that was to the rug in front of the sink. I had a runner there previously and thought a smaller rug might work better. This one from Dash and Albert matches the mangle cloth almost perfectly. As the cook in this small kitchen, I try to make every single inch functional. It just makes sense to use necessary items for decor. If something doesn’t serve a purpose, it’s not on my counter. Functional can be pretty too. This little corner shelf houses my Baltic dishes that I got when we closed my father-in-law’s home. I use these all the time and love having them out where I can see them. When my kids were still here, the three of us spent a lot of time in this kitchen. Back then, I had a round table and chairs where the island sits. They would do homework while I did dishes! When my daughter left for her first year of college, something happened that brings tears to my eyes when I think about it. We stopped eating at the table. My husband, son and I began eating dinner in our family room. I know there are most likely several Freudian reasons that this happened. Basically, it was the first step in a long journey of my family growing up. So after a few years, I replaced the table with this custom island. I no longer had to look at the empty chair and the island served many purposes. It provided additional counter space, more storage and it hid my trash can! I designed it and a local carpenter made it for me. I highly recommend having pieces of storage furniture made if you can’t make them yourself. For a very reasonable price I got exactly what I wanted. As corny as it sounds, I believe that the kitchen really is the heart of any home. That’s certainly true here…On Sutton Place. Thank you for spending time with me, your kind comments and your encouragement. I’ll be back in a day or so with another strawberry recipe! Love your kitchen. Do you know the color of yellow on the island? It is beautiful! Yes. The paint color on the kitchen island is Laura Ashley Cowslip 4. The Laura Ashley colors are available at Lowes. Thanks for stopping by! I love the simplicity!! This picture this jar. Love everything about this. I would love to see a shot showing the whole kitchen to see how it all fits together. It is so cozy and friendly! I could almost smell the cookies baking! Your kitchen looks great! Love your new appliances and the slip covers for the backs of the stools is so neat. Love that little stripe on them and the valence. 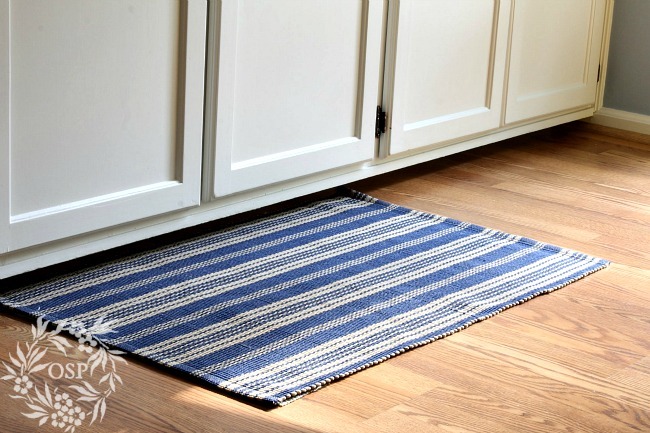 Your kitchen looks so ready for Summer. Such a clean country look to your kitchen! I like it! Your kitchen is very pretty, Ann, I adore the topper on your window and the chair covers are very pretty. Hi Ann! Oh, beauty, beauty, beauty! I love your kitchen and yay for you getting new appliances. I have the same problem – a tiny space for a fridge. We need another one and it’s hard to find something to fit that doesn’t look dinky! Now I love every inch of your kitchen and that yellow island is gorgeous! Your kitchen is so pretty, Ann! Beautiful kitchen! 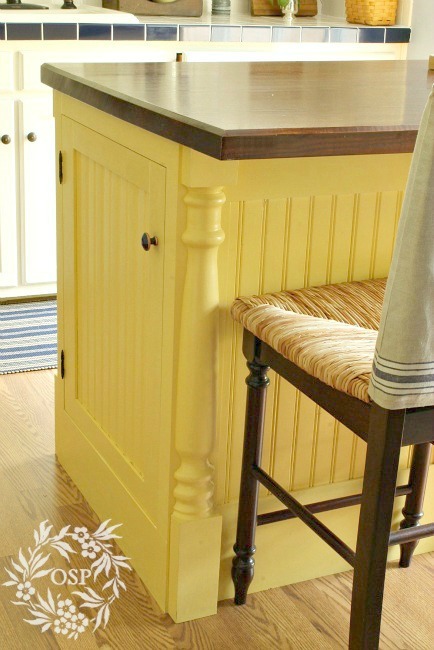 Love the yellow island, and the edging on your countertops. Your kitchen looks great. Mine is small also and I dream of new appliances – maybe when we get the last one out of college in a couple of years! Love love love your kitchen Ann! Your new appliances look fabulous and I .love the new valance and chair slips! Ann your kitchen looks great! I adore those curtains and chair covers you maif. Such talent, I’ll tell you! 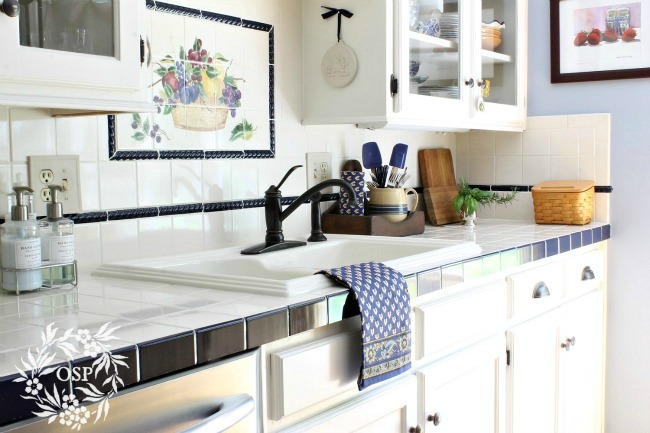 Your kitchen is beautiful — I love the blue and white…and I especially love the story behind your kitchen island. Oh, Ann, it looks beautiful! Warm, inviting, functional, and yet so pretty. I love your new appliances… how exciting! My favorite is the cloth… love what you did with it! Oh, and the dishes are so pretty. It’s all fabulous! I love you kitchen Ann, always have. The blue and yellow combination is so pretty, warm and inviting! Your kitchen looks WONDERFUL! I love your new appliances and they way your valances look…and the covers for your seat backs. You have done a beautiful job pulling everything together, Ann. I know what you mean about moving from the table when a family member is gone. We stopped at some point, too, and once you stop you never really go back, do you? Love the new appliances. We got a SS dishwasher when it needed replacing, but the others are white and I would love to change them. Your kitchen looks great with all the new little touches. I love your kitchen, especially the splash of yellow with your island. Blue and yellow look so pretty together! 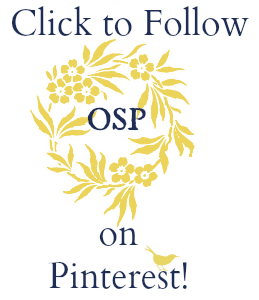 Thank you for sharing your talents and love of decorating! Love the kitchen. Blue and white…..my ultimate favorites. Also love your yellow island. Kitchen size doesn’t matter as long as you can have everything you need where you use it, and it works for you! Great job as usual! P.S. where do you get mangle cloth? I love what you did with it. wow–the very same not-eating-at-the-table thing happened at our house when my oldest daughter went off to college. only in my case, i know why. i’m the one who started it. i just couldn’t face sitting at that table, where we had eaten every night for 18 years as a family, without her. it felt so empty and wrong with just my husband, younger daughter and me there. i couldn’t do it. so, we’ve eaten in the family room ever since (14 years, now). to this day, we only eat at the table when company comes. Yes. Same here. I have a lovely dining room table that never gets used. I guess it’s our way of coping with the adjustment. It was a huge relief when eating at that kitchen table was no longer an option. The guilt went away! Oh my gosh that was my biggest fear…that something would die and I would need to replace it quickly. I wanted to take my time and make sure. Thank you for visiting! I love hearing from you. Ann, we’ve both been kitchen fluffing lately. 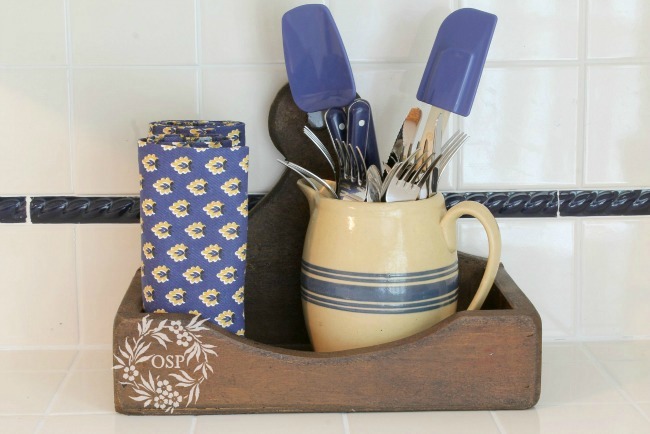 I’m getting ready to post about a few minor changes in our kitchen, too. 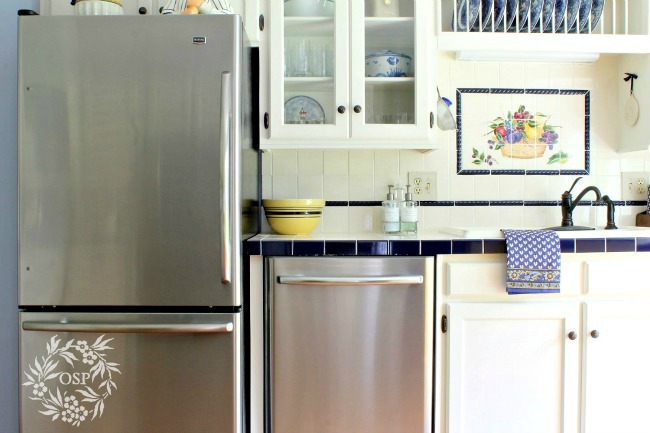 I have always admired your kitchen with that gorgeous dark blue cabinet and yellow island. 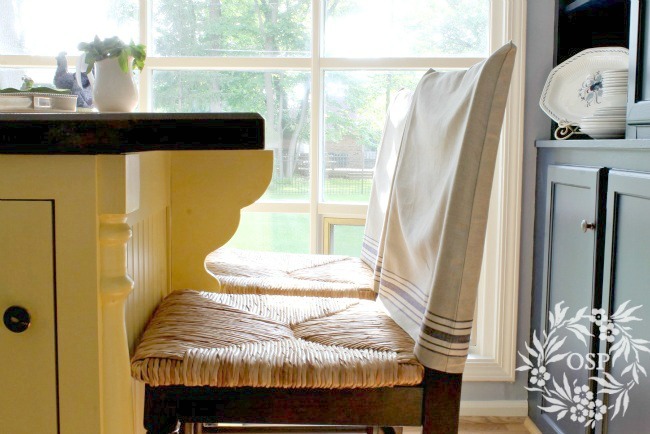 Your new stool covers and valance are the perfect compliment and are so…YOU! Ann, you have such a beautiful kitchen! I love the tile work above the sink. So pretty! 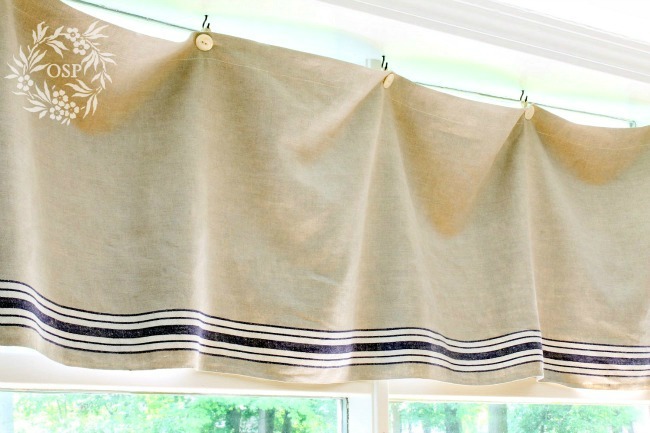 And your little valance is just adorable … the perfect touch! I absolutely love your kitchen. LOVE it, and I love that it’s your school’s colors! I agree with your philosophy. Until I found a place to hang my painting, it was getting in my way on my counter. There’s nothing on my counter right now that I don’t use everyday. I even put small appliances away that I don’t use often. You’re kitchen is so pretty, Ann! Our house is rather out of proportion, and our livingroom is the largest room, with our kitchen being a modest size, so I can really relate. I am going for more practical, as well. Ironically, I haven’t posted on my blog for awhile…I’ve been doing a lot of soul searching, and I’m going minimalist. With that comes practicality. That being said, I still love pretty. So I would say, I’m becoming “pretty practical”! By the way, in case I haven’t said it lately, I love the color of blue in your kitchen. Oh, one question I have! I love your counters. How long have you had them, and how well do they hold up? Needless to say, we need a new countertop! The tile counter tops are 15 years old. They have held up remarkably well. I did the tile because it was so much more affordable than anything else available at the time. The grout is always an issue but over the years I have relaxed and tried not to obsess that it’s not always perfect. There are easy, temporary fixes for it now so it looks much better! Thank you for saying that. I appreciate it so much. Our family dynamics certainly did change…in fact they change on a regular basis now! I love it all, Ann. You must be thrilled with your appliances. And, your yellow island makes my heart go pitter pat. The new additions to your kitchen look beautiful, Ann. I have always admired your kitchen. Enjoy your new appliances! Your kitchen is beautiful Ann, I love all the blue. You seem to do things so effortlessly. All your rooms have a crisp, clean, fresh, and happy look. Blue is my favorite color. Love your kitchen! Your kitchen looks lovely! Very natural and homey! 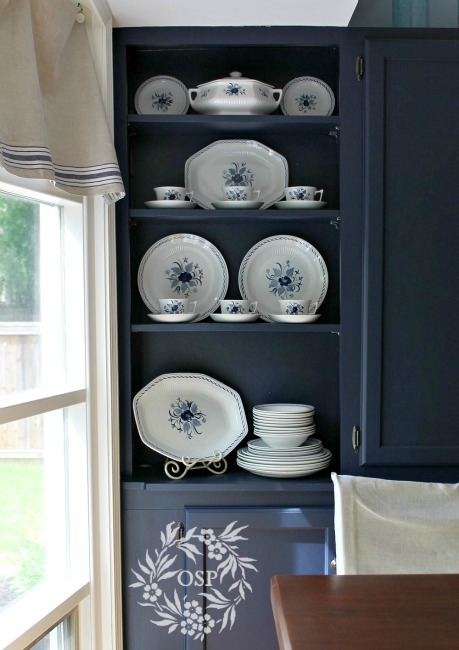 I’m such a fan of blue and love that cabinet with the dishes too. Ann, your kitchen is beautiful and I love all the accents you have added. 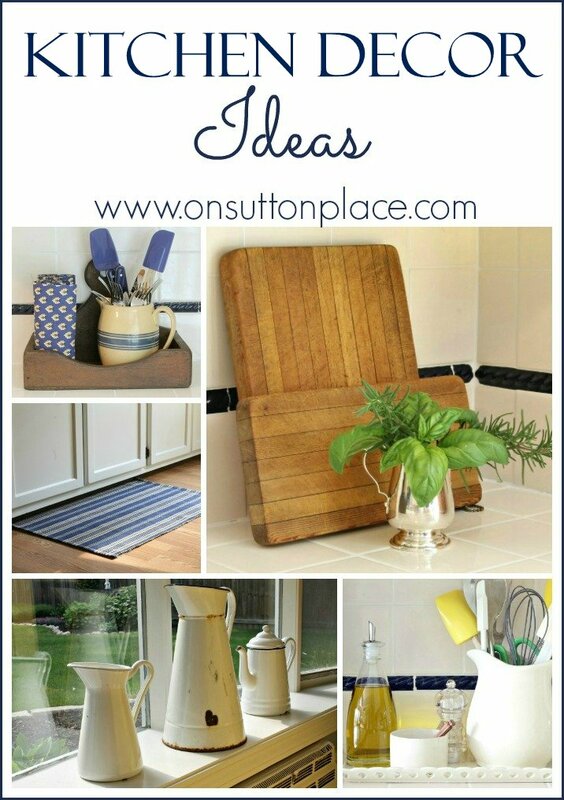 You have me drooling over the butcher blocks and the silver pitcher! I love your kitchen Ann. Not only is it functional but more importantly, it’s adorable. I can see that every piece has been carefully selected and the new appliances are super. You are going to love having the freezer on the bottom. 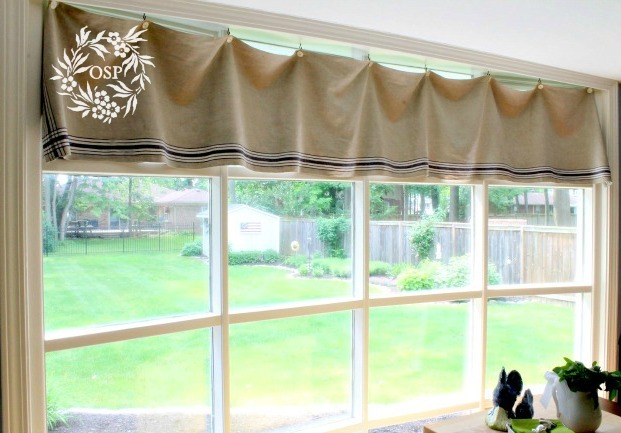 The valance you made for your beautiful window is very special. I love the fabric and how lucky you were to have enough for the chair sleeves. Just perfect! Lovely valance and stool covers. Shiny, new appliances. Sharp-looking new rug. Congratulations, Ann. Your kitchen is a delight to visit . Ann, your kitchen looks so pretty. I always enjoy seeing the blue that you use. We are at exactly the stage you described since we moved to this new house. Our oldest son didn’t come with us. Now we rarely eat at the table and if we do the TV is one. Something’s just wrong about that. Looks great, Ann. I love the valance out of that cloth. Your kitchen is so bright and cheery. 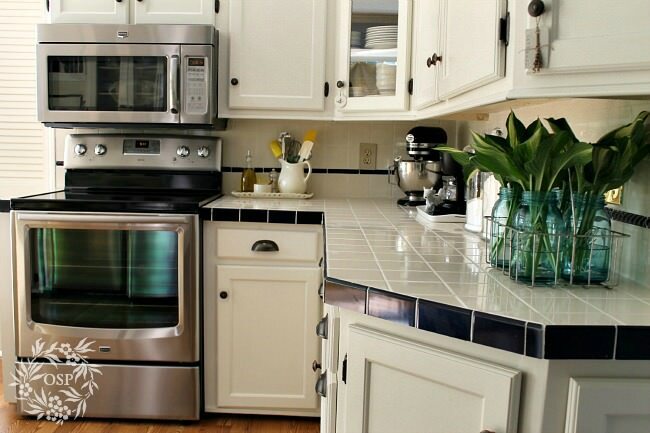 Love your new appliances in your pretty, bright and cheerful kitchen, Ann! Ann, your kitchen is a real charmer!! You have made every inch and corner into a delightful place to hangout, since we do spend a lot of time in our kitchens. Congrats on getting new appliances! I’m jealous. I’d love to have stainless steel appliances. They look great. I bet you really do feel like you have a new kitchen now! 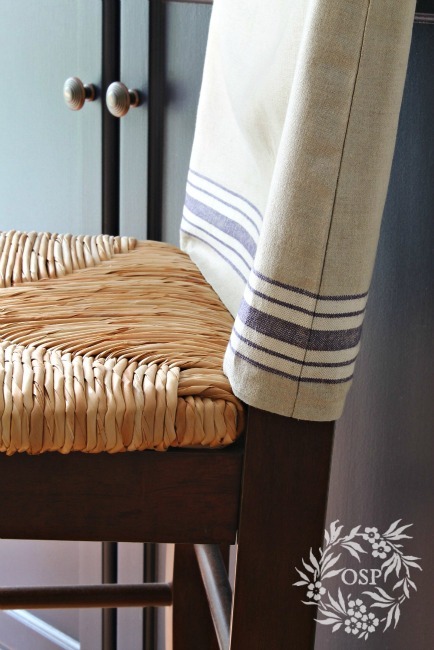 Your valance and bar stool slips are so pretty. 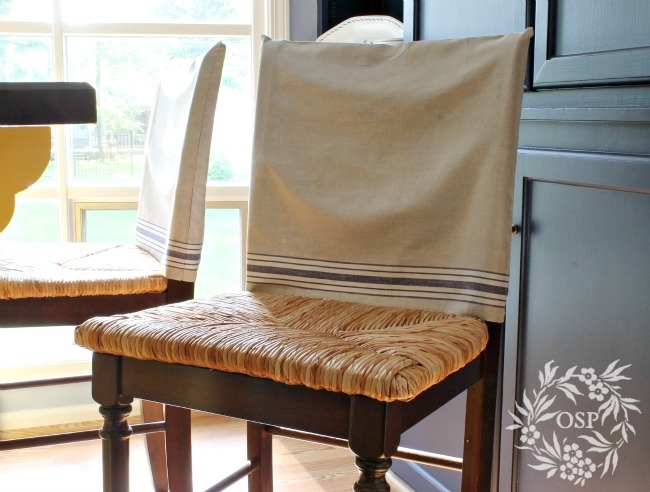 With your wonderful sewing abilities it just wouldn’t be right to have store bought linens in your kitchen! I’ve always loved your kitchen! So bright and pretty. Maytag certainly is a wonderful brand. When we got married, my grandmother gave us her old Maytag washer and dryer to use “temporarily” until we bought our own. They were purchased in 1968 (before I was even born) and we started using them in 1990, and used them for the first 10 years of our marriage! Now THAT’S a good appliance! LOL! I remember you used to have a cute little tassle-like item hanging on one of your kitchen cabinets. I think it said the word “nest” and had a little moss covered nest on it too. Do you happen to remember where you purchased it? Hope you have a wonderful day! Yes Jami Clune makes those clay tags. Her blog is Freckled Laundry and she has an Etsy shop with the same name! Thanks so much, Ann. Looks like she’s on vacation right now, but I’ll keep checking back. I’m definitely going to order one. Thanks again! Ann, I love your kitchen. 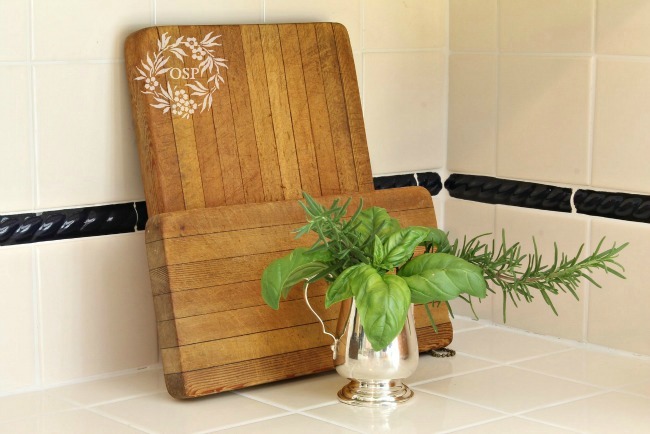 I love the tiles above your sink, your wonderful cutting boards, the yellow island…just everything! Ann, your kitchen looks so bright and cheery. Your valances are so pretty too. I know I have a smaller kitchen too than my previous one but I still love it. 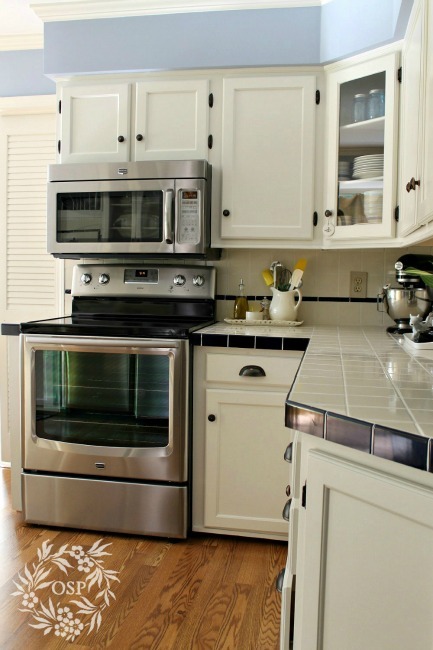 Do you love your appliances, I have stainless steel ones too that I recently purchased. I use a wonderful cleaner for them too, it is called Weiman stainless steel cleaner and polish it even smells wonderful.